The weather looks like it might change again a few days of a glimpse of sunshine and then the rain! 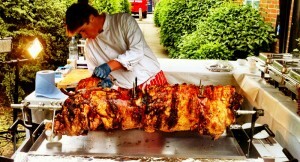 Hog roast Polgooth have had a really good week we were catering in our community this week for a Christening and it was lovely, a baby boy only six weeks old and he was tiny! We were asked to cater for two hundred guests and we put on a delicious spread. We cooked a hog roast in Polgooth accompanied by racks of chicken and the smell of the chicken cooking was absolutely delicious with the chicken we made stuffing and gravy and served the chicken with baby new potatoes in garlic butter and green beans and parsnip the plates looked absolutely delicious and the guests thought so too! The weekend we are so looking forward to as we are travelling north for a birthday the lady is celebrating her 90th birthday and we know it will be a fabulous day the lady is an ex caterer so she knows her stuff and we are out to impress! Pig, crackling and apple sauce are on the menu as well as lamb and seasonal vegetables we are also going to make an array of salads we pride our selves also on our fantastic sauces and are always coming up with new ideas to spice up our events with our tantalising sauces! The event is being held in the local church hall so we have plenty of room to set up our equipment. 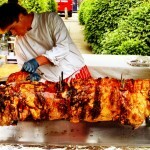 Next weekend is a hog roast hire in Polgooth and we are out on the Saturday and Sunday. Saturday for a small gathering a 30th birthday and that is on the Saturday evening and we will have to be up at the crack of dawn on the Sunday for another Christening, so we are going to be busy but we have everything taken care of we are so organised and we are lucky enough to have the best suppliers in the business and that is half the battle when you have people you can rely on it makes our job so much easier and stress free, well as they say no rest for the wicked must get back for more preparation!